Rewards:You will earn 2 rewards points for purchasing this item. 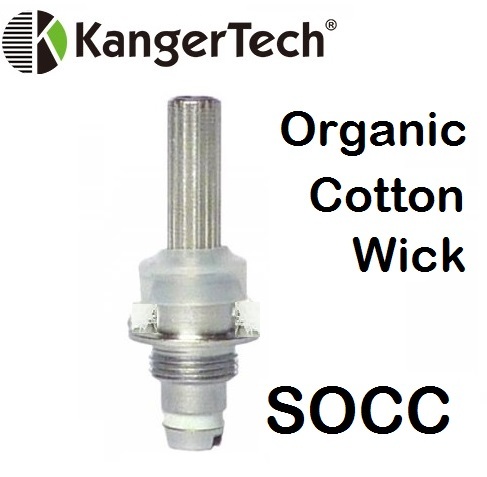 These are the NEW Organic Cotton Wick replacement heads for the Kanger EVOD tanks, the Kanger Protank 2, and Protank 2 Mini. Require assembly into your compatible Kanger Bottom Coil Tank. No warranty offered for this product. Burning out quickly and not up to standards. I'd been using these coils for a while and getting up to a week on each. Recent batches are burning out in just over a day. Not satisfied with these at all. They don't absorb the juice as well and I've ended up with "dry burn" after following the usual starting procedure what I thought were well-soaked coils on first hit quite a few times. Have actually pulled the chimney out and put a drop of juice on the cotton in the coil and had the same problem.... the cotton just won't soak up enough juice to NOT dry burn! These coils use to last a week, now they only last a day or two before burning out. Gotta try a change. Dunno if it's a recent batch or not, because I've not ordered these before. However, the two I received from my 9/4/16 order were horrible. They burned out within 2 days and resistance started spiking almost immediately, before they ever started leaking and before the vapor declined. I've been on these for a couple weeks now. They do seem to wick a bit better and have better flavor. I give them an A+ !!! FYI I use them in a pro tank 2 and hit it hard ...ALL day long ! I've had no luck with these, burn out in less than a day and they leak. These coils are defective. The wick came out of some and when you tried to use them you got some of the vapor liquid. I received just what I ordered in just a couple of days. Quick delivery is important to me. I'm going to browse the site now and see what bargains I can find. excellent, exactly what I ordered and expected - love the prompt delivery! These coils last longer and give me the resistance I like. This coil seems to give flavors a "lightness" compared to the standard Kanger coil. I don't mean that the coil reduces the flavor, it just makes it lighter/brighter. I tend not to like straight fruit flavors because they are too light/bright so, for example, I prefer blueberry pie to straight blueberry. Because this coil makes the two flavors I tried lighter/brighter, I'm not completely sold as of yet. Also - as an ex-smoker I prefer some resistance on the inhale and this coil cuts down on the resistance - but it does not make for an "airy" inhale if that makes any sense. As I've just started using these coils I can't speak to the longevity of them. I will continue to try them on other flavors. Q: when I order these coils how do I know what ohm option to pick? A: The lower resistances are more suited for an unregulated(non variable) battery, but if you are using a battery that the volts or watts can be adjusted on then you would want to go with the higher resistance. Q: Can I not get a box of Kanger socc evod coils, do you not sale by boxs? Q: Do these coils work with the Kanger Mini Pro-tank 2?